Someone may have already come across this recipe I made, but it’s too good to not share. My wife and I love fried catfish, but finding a breading that is Paleo and that actually sticks to the fish has been difficult. My wife had all but given up before I took it upon myself to conquer fried catfish. I must have gotten lucky, because I got it right on the first try (and I’ve since been able to replicate it with 100% success!). I use fresh, wild-caught catfish. I got 2 lbs of it for this recipe. For the oil, I use refined coconut oil. Ensure there’s enough in your pan to cover the fish 1/2 way up. I heat the coconut oil on high and let the oil get nice and hot. Then, after cutting the catfish filets into four pieces, I use the natural moisture from the fish and pat it into the flour mixture, ensuring that all sides are well-covered. I then carefully place the pieces into the oil and cook them on each side for about3 3-7 minutes, depending on thickness. Turn them carefully with tongs to ensure you don’t pull the “breading” off. The most important part here is to not cook them based on time, but on internal temperature: minimum 145 degrees Fahrenheit. Once the fish is at temperature, place onto a plate that has a paper towel on it to help get some of the oil out of it. Serve! My wife, her mother, and my son all say it’s the best catfish they’ve had! It’s really that good! I hope you enjoy it, too. Let me know how it goes if you try this recipe. These Paleo, Vegan and allergy friendly Pumpkin Plantain Muffins are free of grains, gluten, eggs, dairy, soy, nuts and added sugar. If you like plantains, they are a great guilt-free snack or treat. Every now and then, I keep a log of the food I eat during the day to benefit those who are interested in what I eat on the Paleo Diet. Bear in mind that this is the same diet I ate while losing 150 lbs. The best part: I’m now maintaining nicely on the exact same diet of filling, delicious, and nutritious food! I ran yesterday, so I not only was able to add a dessert to my dinner, but I needed to get some carbs in me to help my muscles heal up after today’s brutal run. It was very hot out, and my legs really struggled in the heat. They definitely were burning when I was done, something I don’t like to feel. Were it a non-running day, I would have skipped the brownies. Last night, Sherry took my cousin and I to Charivari, a special restaurant that has some amazing Eastern European food to include some Hungarian specials. I split a Foie Gras with Apple Slices with Sherry as an appetizer, and we both ate Jaegerschnitzel with Spaetzle as our main courses. I know; Spaetzle is non-Paleo, but it was a special occasion: my cousin and I haven’t seen each other since last year and he flew out specifically to surprise me for my birthday. For dessert, the three of us split a delicious and perfectly made Dobos cake. Again, non-Paleo, but so be it. 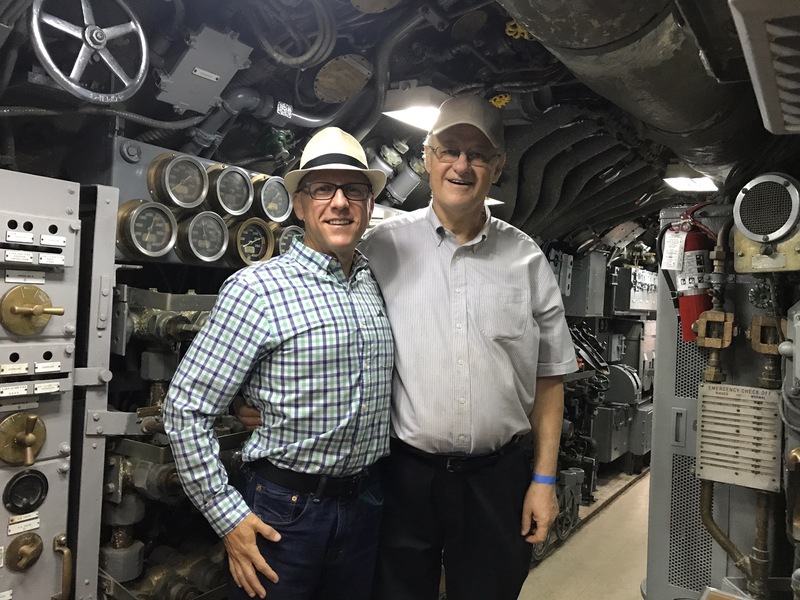 My cousin and I aboard the USS Cavalla, a WWII Gato-class submarine. This morning, my weight was exactly where it was the day before; not an ounce gained. Perfect. For breakfast, I ate the pulled pork and apple egg casserole that Sherry had made earlier in the week. For lunch, we went to Gaido’s in Galveston where I had a grilled grouper with crab topping served with asparagus: a 100% Paleo lunch. For dinner, we went to a local favorite, Alicia’s, where I had the Puntas Chimino which is ham, bacon, beef, mushroom, onions, and jalapeños grilled in a cast iron pan with a side of grilled vegetables (zucchini, squash, carrots, and onions) and pico de gallo with avocado as a relish. Once again, a 100% Paleo meal, although it was a bit on the large side. I ate all of it, and nearly two hours later, I’m still stuffed. I know that there’s a good chance I will gain a little weight, if only because of the volume of food I’ve been eating. I will run tomorrow morning to work off some of the excess calories and water weight, but truth be told, it’s all worth it. It was a day of amazing food, amazing company, and a special visit for my 50th birthday. I always say that you have to live a little, even if you’re on Paleo. I made the best food decisions I could with a little bit extra here and there. I know the consequences, and I fully accepted them, and it was totally worth it. Palate fatigue is what you get when you eat the same foods over and over again and you don’t want to eat them anymore. It’s very real, and studied a lot because it is what keeps humans from being able to eat the same thing day after day, week after week, month after month. This is what keeps us from having the one, perfect food. Us humans like variety, and it’s more than just preference: it’s in our nature. What happens when you eat the same food, regardless of how good it is for you, day after day? You tire of it and become unable to eat it. Some people say they could eat pizza every day non-stop, but the reality is that you would get tired of pizza, and eventually, you’d grow to hate it. Palate fatigue is one of the reasons people fall off diets. They take on restrictive diets that limit them to one type of food, or very few types of foods, and eventually, palate fatigue kicks in, and these people are forced to find an alternative. A good friend of mine was on a restrictive diet once, and he told me that he lost a lot of weight and felt good on this diet, but the food was so bland and boring that he dropped it. It’s actually the idea behind the Cabbage Soup Diet: eat all you want, because eventually, you won’t want to eat. This is horrible. There is no reason to hate your food. I am fortunate that there are as many Paleo options out there as there are non-Paleo options. Heck, most non-Paleo foods have a Paleo-friendly alternative. I was thinking about the food I eat today, and it dawned on me that I really enjoy what I eat, it’s delicious, filling, and I’m never bored with it. Sherry does a great job of rotating through recipes, even my favorites. Even though I tell her I can eat the meatloaf or chili all the time, she rotates those with other favorites so that I don’t even get close to palate fatigue. Don’t eat the same boring foods day in and day out. You will be unhappy, and eventually eat foods that aren’t good for you. Check out the recipes on her blog for a starting point. My wife prepares our food for us on the weekends so that we can have lunches and dinners throughout the week that are Paleo (which means delicious and filling). This week, I made some pulled pork which she used to also prep our breakfasts with a pork and apple egg casserole that starts our day off right! This past Saturday, lunch consisted of buffalo wings that she prepped and I grilled (they came out PERFECTLY) along with some sweet potato country fries that she made in the oven that had some rosemary on it. So yummy! As for Sunday, we used the fresh pulled pork in little sandwiches! Sherry made some Paleo buns and I had two pulled pork sliders! I didn’t need any sauce: the pecan wood smoked pork was delicious on its own! This week’s prepared foods include meat loaf, chili, and quiche. Sherry asked what I wanted for lunch this week, and I started my list with those three. Since these three are favorites of mine, she indulged me by preparing and packaging them for us. I can’t say enough how wonderful it all is, and my lunches have all been spectacular! Tonight, we’re going to eat something from the prepared foods in our refrigerator, and I know I can’t go wrong regardless of which box I choose. Sherry also made some Paleo thin mints that are about the size of a large Peppermint Patty. These are amazingly delicious, and make for a great end to our meals. The packaged meals tend to be on the smaller size, so having this little bonus serving rounds out the meal. Eating right doesn’t have to be dull, bland, boring, or repetitive. All the food I eat is none of those things! There are recipes available on Sherry’s site and all over the Internet. Sherry and I in Madrid. Something Sherry talked about in her post a few days ago about returning from vacation and getting back to our “Normal Paleo meals” really struck a chord with me. Back in September 2015, I never could have imagined that our journey would be as successful as it’s been. I never thought we’d be so comfortable with a lifestyle that is so radically different than the one we were living. I never thought I would hear myself saying, “I can’t wait to get back to eating our healthy foods” after enjoying two weeks of non-Paleo treats. The fact of the matter is that now that we’ve returned, after only three days of Paleo food, I’ve started feeling more myself than I have for the past few weeks. Don’t get me wrong. The food and drinks I’ve been enjoying for the past two weeks have been stellar and treat after treat, but therein lies the problem: they were treats. I’m glad to have enjoyed them, but now, it’s nice to be back to our normal food. It’s filling, it’s delicious, and most of all, it’s nutritious and feeds our bodies properly. I gained 14 lbs in the 11 days we were in Spain, and in three days of eating Paleo, I’ve lost 11 of those lbs. Of course, it’s all water weight, but the food I’m eating now doesn’t promote water retention in my skin. My body is back to looking lean, and I don’t have a pudgy appearance anymore. Oh, and I’m almost back to my pre-vacation weight, to boot! Once you embrace the lifestyle and accept the benefits, it becomes the new normal. It becomes not only comfortable, but something you crave because it makes you feel so good to eat wholesome, quality foods. Don’t just take my word for it. Commit to it, stick to it, and you’ll find the same.